Every Saturday, I host a feature called Kid Konnection -- a regular weekend feature about anything related to children's books. This week, I'm going to share with you a fun book that is also educational. Summary: Why do zebras have stripes? Why don't cats like water? Why do sharks have so many teeth? When it comes to the facts, every child wants to know: Why? 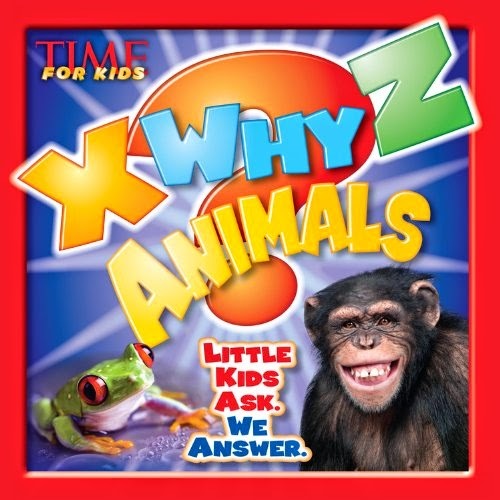 Now, with X-Why-Z Animals from Time For Kids, young readers-and their parents-can discover the answers. This book satisfies the never-ending curiosity of children, ages 4 to 6. X WHY Z ANIMALS: LITTLE KIDS ASK, WE ANSWER is a fantastic resource for those families with children who are interested in animals. This book is geared towards children ages four to six with its simple explanations; however, if I'm being entirely honest, I really liked it too. And I even managed to learn a few things about animals! X WHY Z ANIMALS is another book in the X Why Z series, and I can see why these books are so popular. This particular book makes learning about different animals fun with the question and answer format. I can't believe all of the fun facts that this book contained! The format of the book is so user-friendly (or should I say reader-friendly?) Each chapter is about a different family of animals, so there are sections on Mammals, Reptiles, Amphibians, Insects, Arachnids, Sea Animals, Birds and Dinosaurs. Then, each page spread has multiple questions and answers along with some adorable photographs. In addition, there are X Why Z Facts thrown in which provide even more information. Finally, there is a useful index in the back of the book in case you are looking for something about a specific animal. I can pretty much promise you that kids will love this book. There are useful facts about animals we encounter every day like our pets, but there is also some pretty weird stuff about other less popular animals. What makes this book so great is that the questions this book asks are ones I've heard my kids ask or ones that I've even wondered about! I also really appreciate is that the information is presented in such a simple way. There is a brief question posed, and then a clear answer that is just a sentence or two so it's ideal for even curious toddlers. X WHY Z ANIMALS is a super book for animal lovers and kids of all ages. Highly recommended! Thanks to Goodman Media for proving a review copy of this book. This sounds like a great book for animal lovers. One of my nephews would have gone crazy for this when he was little. I bet I'd learn something if I read that book!